All those who helped save the lives of those involved in a light aircraft crash in Brading Marshes have been recognised for their efforts. 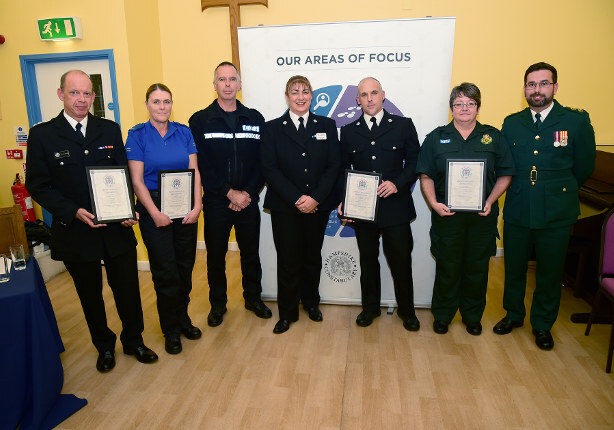 Officers and members of the public who helped to save the lives of two people in a plane crash on the Isle of Wight have been recognised for their efforts. They were among award-winning police officers, police community support officers (PCSO’s), police staff, special constables, and the public who attended the district commander’s awards ceremony at Newport Congregational Church on Monday 15th October 2018. One officer was presented with a long service medal alongside various other awards for: sixteen other officers, four police community support officers, one special constable, two members of police staff (retired), and four members of the public (including a two members of the Isle of Wight Ambulance Service and one member of the Isle of Wight Fire Service). “I’m delighted that we take this opportunity every year to recognise the hard work and achievements of my officers and members of the police family. It’s also important to highlight the work of the public, which helps us to keep our community on the Island safe. “The teamwork and dedication shown by those that helped to save the lives of two people following a plane crash at Bembridge in July is just one example of the outstanding work that’s been undertaken on the Isle of Wight. On Thursday 12th July 2018 at around 3:50pm PC Nigel Allen was flagged down and told about a possible plane crash near Bembridge. Officers begun searching the area in line with the runway at the airport. Meanwhile PC Lorraine Buxton and a colleague decided to go to the highest point in the east of the Island – Culver Down – to try to spot the plane. This decision aided search teams to locate the plane quickly as they could be guided to it by the officers at Culver Down. The light aircraft had crashed in a remote and difficult to access area in the middle of a nature reserve, which had ruts and water courses. The closest footpath was around 20 minutes away on foot and emergency services vehicles found it difficult to reach the site. Three members of the public who had been in a helicopter in the area were already on scene. They had started first aid for the two people – the pilot and passenger – who had been in the light aircraft, just before the PCSO and first police officers arrived. They were both subsequently taken to Southampton General Hospital by air ambulance to be treated for serious injuries. The crash is now under investigation by the Air Accident Investigation Branch. The actions of every officer from all three emergency services dealing with the crash helped to save the lives of the two people in the plane. PC Nigel Allen representing the officers from the Island’s response and patrol teams who assisted. PCSO Karen Allen and Sergeant Justin Pringle representing the Neighbourhood Policing Team officers who assisted. Graham Orchard representing the Isle of Wight Fire and Rescue Service officers who assisted. Mary Long and Darren Claydon representing the Isle of Wight Ambulance Service staff who assisted.